1) What is inside the Deltasorb® canister? 2) Will the canister leak anesthetic gas if the cap is not on? 4) How much does the canister weigh when full? 5) Is it dangerous to carry or transport the canister in a hallway when people are around? 6) What types of anesthetic drugs does the Deltasorb® canister capture? 7) Does it matter at what height the canister is attached to the Anesthetic Gas Machine? 8) Does the canister capture anything else besides anesthetic gases? 9) Is the canister, or are its contents flammable? 11) How and where are the canisters delivered? 12) Does the canister become hot while capturing the drug? 13) Where do the full canisters go after being picked up? 14) Will anything come out of the canister if shaken or held upside down? 15) What happens if the cap is lost or not closed properly when not in use? 16) Why is there a Serial Number on the canister? 17) Will a missing LABEL cause a problem? 18) Is a Nurse or RT required to handle the canister? 20) What is the canister made of? 21) How is the canister mounted on the anesthetic gas machine? 22) When is the best time to change a canister? 23) Are there training materials provided for hospital shift changes and turnover? 24) Have you ever had any accidents or health incidents related to the use of the Deltasorb® canisters? 25) What happens when the canister is full, and not removed from the exhaust line? 26) What happens to the anesthetic when you take the canister back to your plant? 27) Do we receive a report on the amount of anesthetic we have prevented from entering the atmosphere? How often? 28) Can the canisters be shipped across the Canada and the US borders? 29) Is there any fine-tuning required on our anesthetic machines to use the canister? 30) How long will it take to be up and running with the Deltasorb® Service? Each Deltasorb® canister contains Blue-Zone's proprietary adsorbent for the capture of anesthetic gases. Once captured, the anesthetic gases are trapped on the adsorbent until subjected to specific operating conditions at our production facility. The cap is simply a cosmetic add to avert any concern from the untrained eye. Once a hospital joins the program, we will use the first few collection reports to establish an efficient, site-specific canister change-out schedule. Approximately 5 lbs and each canister can adsorb approximately two full bottles of halogenated anesthetics. No. The canister is simply a filter containing no hazardous or dangerous materials. However, it does weigh approximately 5 lbs and should always be treated with care. The Deltasorb® canister captures the three major halogenated ethers in use - Desflurane, Sevoflurane and Isoflurane. It is the only viable option for Halogenated Anesthetic Drug Recovery in the world today. No. 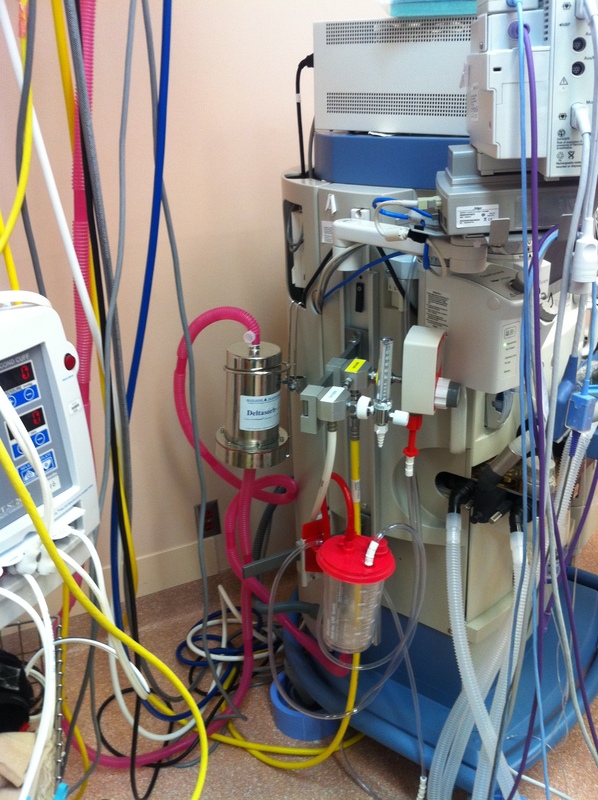 As long as the canister is inserted in line of the scavenging system, its physical location in the OR theatre has no bearing on its collection performance. Other than some moisture related to site-specific factors, no. The proprietary material selectively adsorbs only halogenated ethers (Desflurane, Sevoflurane, Isoflurane), allowing all other molecules to pass through the system unimpeded. Using an analogy, it works like a lobster trap. The canister is not considered flammable. The exterior is made of stainless steel and the adsorbent is a high silica material like sand. Neither the canister nor its adsorbent material is considered hazardous or dangerous. Prior to launching the program, Blue-Zone consults with each hospital to develop a convenient canister cart exchange schedule. Generally, 'used' carts are exchanged for 'fresh' carts at the hospital shipping docks on a weekly basis and this procedure will become routine rather quickly. The process of adsorption generates some heat (though not excessive). It is an exothermic reaction, which is  a chemical reaction that releases energy in the form of heat. Used canisters are returned to our production facility where they are desorbed of their anesthetic capture, at which point they are ready to begin another collection cycle. There is a screen at the top and bottom of the canister that is designed to retain the adsorbent within the canister. If the canister has been subjected to excessive vibration, a small quantity of the silica-based adsorbent can form a fine powder that may pass through the screen. The cap is cosmetic. The canister will not 'leak' unless subjected to controlled operating conditions similar to those in use at our production facility (100 degrees C; 1700 L/min). The function of the cap is primarily to keep the canister clean on the inside. Each canister has its own unique serial number, which is used for tracking purposes. We are aware of each canister's location at all times. The Hospital can manage canister labels however they deem most useful. We recommend removing labels from used canisters in order to clearly distinguish between used and fresh. At the same time, regardless of whether their labels have been removed, all canisters are processed through the same channels once they arrive at our production plant in Concord, ON. The hospital has the authority to decide who is responsible for canister handling and change-outs. Both jobs are simple enough to be performed by virtually any department. As a general rule, canisters should be handled consistent with the normal safety precautions that operating staff use for handling equipment used in the operating room. The canister comes with plastic caps for the top and bottom ports and these should be in place when the canister is not attached to the AGM. The canister is made of 316 stainless steel. At the onset of the program, we provide stainless steel mounting brackets for the hospitals to use for this purpose. 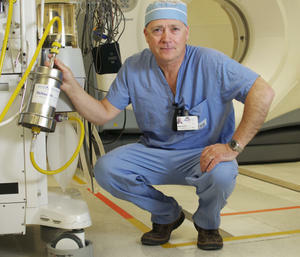 As a general rule, the best time of day to change canisters is at the end of scheduled surgery. Blue-Zone works with client hospitals to develop the change schedule to optimize the quantity of anesthetic captured. All materials are provided for the hospital at the inception of the program. The adsorbent in the canister is capable of capturing the three main inhalation anesthetics in use today - Desflurane, Sevoflurane and Isoflurane - up to a specific quantity per canister. Blue-Zone works with client hospitals to develop the change schedule to optimize the quantity of anesthetic captured. When the canister reaches our facility and is weighed and logged into our canister management database, it is fully desorbed of its capture while enabling true halogenated anesthetic drug recovery (the only patent-protected system of its kind in the world), at which point it is ready again to be circulated in the field. Yes. Hospitals receive monthly reports detailing total anesthetic capture in weight and CO2 equivalent tonnage. We are set up with a prominent North American transport company and broker to handle demand on both sides of the border. Canisters are attached to the exhaust port of the AGM's scavenging system and have no impact on the operation of the AGM. Blue-Zone works with client hospitals to develop the best set up to attach the canister to the AGM and this relates to the type of AGM and the hospital's scavenging system. You can see the list of hospitals currently listed as partners in Green Hospitals.